A round table of non-governmental organizations (NGOs) in consultative status with the Economic and Social Council of the United Nations (ECOSOC) was held at Utah Valley University (UVU) on 2 October 2017 in Utah, United States of America. The event discussed possible joint efforts between the NGOs and UVU students to raise awareness about sustainable mountain development issues, especially regarding women in mountains, at the United Nations and in particular during the 62nd session of the United Nations Commission on the Status of Women (CSW62), to be held on 12-23 March 2018. Baldomero Lago, CIO and Vice Rector for Global Engagement at UVU, Andrew Taber, Executive Director of The Mountain Institute (TMI) and Chair of the Mountain Partnership Steering Committee, Jed Shilling, member of the Board of Trustees of TMI, Rusty Butler, main representative of the Russian Academy of Natural Sciences, and Wendy Jyang, President of the Utah China Friendship Improvement Sharing Hands and Development and Commerce, participated in the discussion, on the topic of “Joint Advocacy of the Mountain Women and Agenda at the United Nations”. • Hosting a parallel event together with NGOs with ECOSOC consultative status. 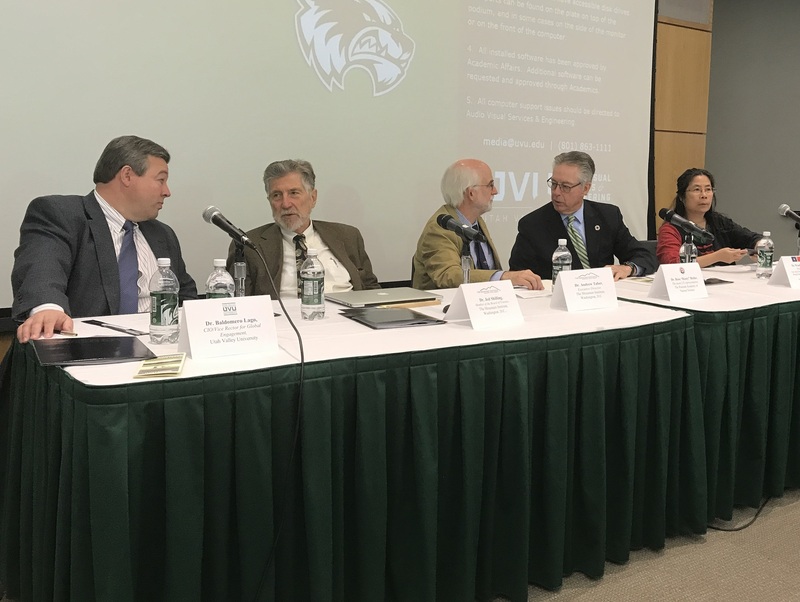 UVU expressed their desire to report at CSW62 how the UVU model of student engaged learning has allowed them to advocate for the gender and sustainable mountain agendas of the United Nations in Utah and globally since 2007. During the event, Baldomero Lago announced the establishment of a new partnership initiative between UVU and the United Nations Department of Public Information (UN DPI), which will provide UVU students a variety of valuable opportunities for engaged learning at the United Nations, primarily through scholarships and research. The round table was hosted by the Utah International Mountain Forum (UIMF), a coalition of student clubs at UVU. UIMF members raised funds and organized activities for the distinguished panelists as part of the student engaged learning initiative.